(1) Preheat oven to 350. Line standard muffin tin with cupcake liners. (2) In a large bowl, whisk together softened butter, yogurt, eggs, and vanilla. Beat until smooth. (3) Slowly stir in dry ingredients. Mix well, making sure there are no flour pockets. (4) Divide batter evenly among cups of prepared tin. ** Cups should be about 2/3 full. (5) Press one strawberry, pointy-side-down, into the center of each cup of batter. (6) Bake for 20-25 minutes, or until cupcake tops are pale gold and springy. (7) Remove cupcakes from the tin and transfer to a wire rack to cool while you make your frosting. (8) In a medium bowl, cream together butter and Nutella. Stir in powdered sugar, and mix until smooth. Spoon frosting into a piping bag, and pipe thick swirls on top of each cupcake. ** If you find the frosting to be too buttery, add a little more Nutella or powdered sugar (1 tbsp at a time), tasting after each addition until you find your ideal balance of flavors. 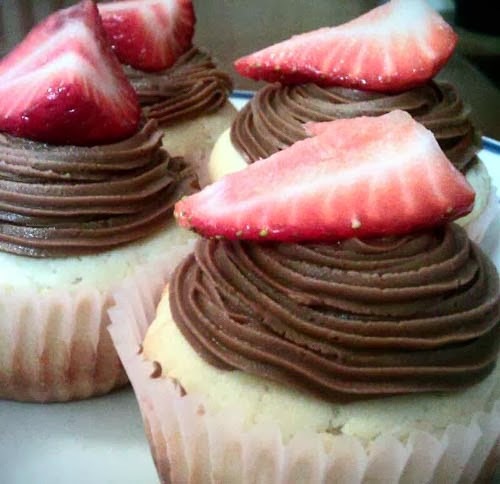 (9) Slice remaining strawberries into thirds, length-wise, and press one slice on top of each cupcake. ** To help the strawberries last a little longer and give them a nice shine, melt together 1 tbsp strawberry jam + 1 tbsp water and mix well. Then, gently brush the syrupy glaze over each berry. Any overflow can be soaked up by gently dabbing with a paper towel.